The Rev. Adam Hamilton, a member of the team that proposed a new structure for the denomination, cites statistics suggesting the church has a limited future if it doesn't make significant changes. 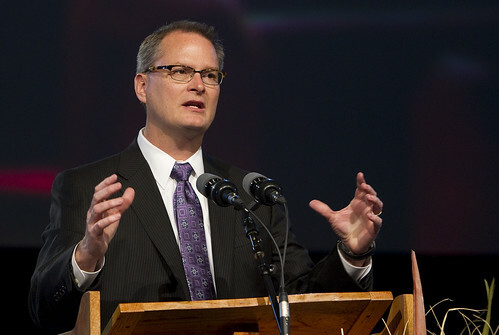 Hamilton, senior pastor of United Methodist Church of the Resurrection in Leawood, Kan., is a delegate from the Kansas East Annual (regional) Conference. A UMNS photo by Mike DuBose. Click on image to enlarge.View more photos. After three days of major speeches, debate over the rules, the election and training of officers of legislative committees, a celebration of impressive denominational accomplishments, a review of present problems and dire predictions about a possible future, General Conference delegates set to work on the 1,200 petitions sent to the quadrennial gathering. All petitions are first considered in one of 13 legislative committees. Those committees broke into subcommittees April 26 to begin considering each proposed change to the Book of Discipline or the Book of Resolutions. Newly elected committee chairs and subcommittee chairs helped the groups prioritize their work, since petitions not acted upon by the evening of April 28 may not be considered at all, unless 20 delegates pull the petitions out of the virtual wastebasket. An impressive opening ceremony on April 24 began with the singing of "And Are We Yet Alive," a hymn that traditionally opens annual conference and General Conference gatherings. By the end of Wednesday evening,The Rev. Adam Hamilton, pastor of the Church of the Resurrection in Leawood, Kan., made it clear that we are clearly alive in 2012, but we might not be in 2037. After detailing a 5.3 percent decline in members and an 8.7 percent decline in attendance over the last five years, Hamilton said the real indicator of the church's future is the 21 percent decline in the number of baptisms and confirmations. "At the present rate, in 25 years we will not have children in our churches," he said. A member of the Call to Action team that drafted the restructure proposal, Hamilton said it was especially important to recruit and train young pastors who can speak the same language as other young people. "We ask you to raise 2,000 young clergy and provide them with a seminary education. &ellipsis; It may the most significant thing we do at this General Conference." Hamilton and other members of the Connectional Table encouraged delegates to adopt the restructure proposal that evolved from the multi-year Call to Action study of vital congregations. "The proposal is not perfect," said Bishop Larry Goodpaster, president of the Council of Bishops, "and it will be improved on in the committee." Responding to people who have criticized the restructure plan as a power grab by the bishops, Goodpaster said, "We do not seek and do not want any ongoing authority." He also assured the assembly that recent questions about increased liability "will be resolved as well." The restructure proposal from the Connectional Table, a plan proposed by the Methodist Federation for Social Action and a Plan B written by an ad hoc group of delegates will be considered in the General Administration Committee before presentation to the plenary session. All legislative committees will present their recommendations to plenary sessions, beginning Monday, April 30. After meeting in legislative committees on Thursday morning, some delegates attended a Service of Holy Communion on a Tampa Bay walkway. Others attended luncheons sponsored by various organizations, and some paused to hear choirs singing in the lobby of the convention center. United Methodist Men, United Methodist Women and the Section on Laity of the Board of Discipleship sponsored a luncheon April 25 at which lay delegates and friends celebrated the ministries of the sponsoring organizations. Progressive groups erected a large tent across the street from the Tampa Convention Center, and they invited delegates and visitors to attend lunch and hear speakers in what they call "the tabernacle." On April 26, the groups honored retired bishops who signed a statement saying they opposed church policies that forbid the ordination and appointment of statements forbidding the ordination and appointment of "self-avowed practicing" gay clergy. Retired Bishop Don Ott told the group that the Council of Bishops held a closed-door session in order to reprimand those who have signed the statement. "I hope I live long enough to see an act of repentance on this matter," said Ott. The Rev. Cheryl Anderson, an Old Testament professor at Garrett Theological School in Evanston, Ill., told the tabernacle crowd that she loves the Bible but hates the manner in which it has been used to support slavery, marginalize women and hurt people. She encouraged people to look at the spirit of Scripture, not individual passages. The Rev. Pamela R. Lightsey, an ordained elder serving as associate dean for community life and lifelong learning at Boston University School of Theology, said it was a myth to believe that African Americans do not support gays, lesbians, bisexuals and transgender people. She declared herself to be a black lesbian who is an ordained minister. She is a clergy member of the Northern Illinois Annual Conference. Sponsors of the tabernacle are: Affirmation, Black Methodists for Church Renewal, Methodist Federation for Social Action, National Federation of Asian American United Methodists, Native American International Caucus, and Reconciling Ministries Network. *Peck is a retired clergy member of New York Annual Conference attending his 12th session of the General Conference, four times as editor of the Daily Christian Advocate, and three times as a member of the United Methodist News Service team.